Your social media campaigns should be about connecting with followers – not peddling your wares. 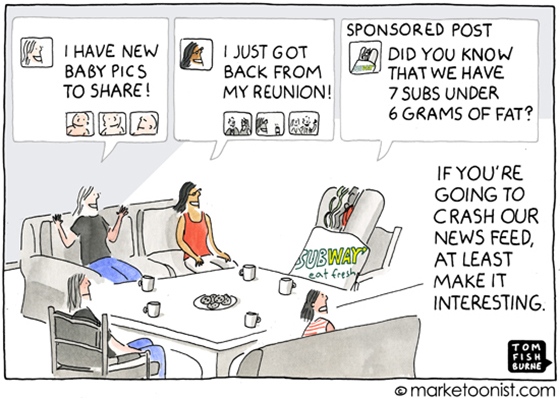 Image by Tom Fishburne. Social media isn’t only about getting likes, repins and retweets – it’s about building meaningful, long-term relationships with your audience. Authority relationships: Relationships where one individual has clear power over the other. One gives instructions; the other fulfills them. Think employer-employee. Exchange relationships: Relationships where there is an equal give and take. These relationships are sustained only as long as both parties continue to offer incentives to remain together. Ever reward a user for a “like” on Facebook? That’s a classic exchange relationship. Communal relationships: Relationships where there is a deep bond of mutual trust between both parties. The relationship does not depend on bribes or incentives to survive; it is propelled along by deep-rooted goodwill and shared common ground. This is the type of relationship we share with our closest friends. Unfortunately, whether they know it or not, many marketers perpetuate exchange relationships, where they “bribe” users to carry out specific actions. Studies show that 67% of users who “liked” a brand page on Facebook did so to become eligible for offers. This model of bribes in return for desired actions is only sustainable up to a certain point. Exchange relationships may be effective for attracting followers, but you may wind up with a pipeline filled with unqualified leads who are only interested in receiving freebies. Here are five psychological tactics to help you connect authentically with your social media followers and lay the foundation for an ongoing communal relationship. Think of brands with distinct personalities – Old Spice (masculine, adventurous, irreverent), Nike (sporty, up for any challenge), UGGs (comfortable, chic, fun) – each brand paints a vivid picture in your mind. When a brand is truly successful in demonstrating what it stands for, consumers identify with the brand’s personality. And that’s when conversations (and conversions) start happening. Progressive Insurance’s bland ho-hum profile page on Facebook has about 315,000 fans. 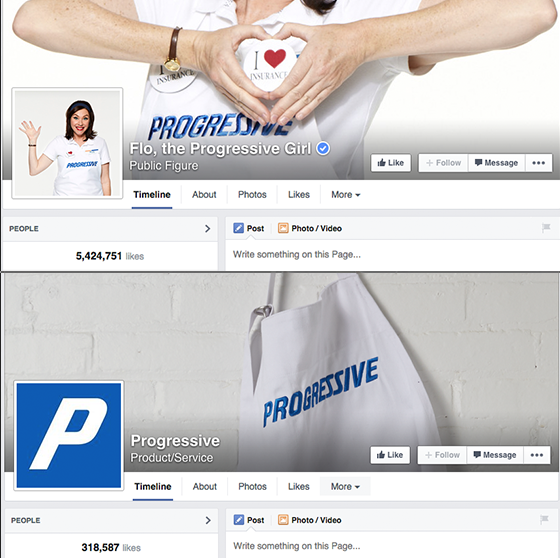 On the other hand, the page for Progressive’s popular mascot Flo, the Progressive Girl has nearly 5.5 million fans! The Facebook page for “Flo, the Progressive Girl” (top) has over 5 million more “likes” than Progressive Insurance’s standard brand page (bottom). This goes to show that it’s easier to be friends with a human on social media than with a faceless marketing machine. Studies show that the closer a brand comes to reflecting human personality traits, the easier it becomes for users to identify with them. And as Robert Cialdini’s “Six Principles of Persuasion” explains, people are more likely to buy from people they like. Showing your brand’s personality impacts conversions. People buy from people they like. Don’t leave that big personality at home. Bring your brand’s personality over to your social media accounts. Let your brand profile, your posts and your voice spell out exactly who your fans are talking to. 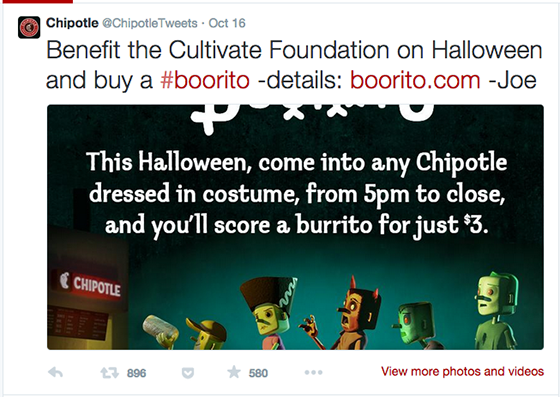 Chipotle does this effectively on their Twitter account by signing each tweet from the member of the team who tweeted it out. Let your employees connect with users one-on-one with their real names and identities. Beyond putting a face (or faces) to your brand name, this offers employees a renewed sense of ownership towards their work and keeps them more motivated. Don’t just ask users to “like” your page in exchange for a coupon or a freebie. Give them a real reason to behave in a certain way. A great way to motivate people to take action is with a compelling narrative. Give users a peek into those small beginnings that have made your brand what it is today, or share the story of a cause you care about. People feel trusted and important when you open up to them. According to research by Roy Baumeister and Mark Leary, the need to belong and identify with people similar to us is a strong emotional driver and motivator. Sharing your brand’s story or that of a worthy cause makes people listen to you more than when you simply peddled your wares to them – and it makes them want to reciprocate by sharing their story with you. Target carried out a hugely successful social media campaign in 2013 that told the story of hunger and people less fortunate than you and me. It allowed users to become part of the narrative by helping to alleviate this hunger. Partnering with non-profit FEED Projects, Target created a whole collection of charity-driven apparel and accessories. Every purchase went towards providing meals for 35-40 hungry people. Some of the apparel from Target’s campaign in partnership with FEED projects. Image source. Target heavily promoted the campaign on social media, resulting in tons of visibility and engagement – and they raised enough money to donate 10 million meals to the needy. Ask your fans to share their own tales to make it an engaging two-way process. Most marketers are so immersed in their brands and maximizing mileage on social media that they forget the most important rule of interaction on social media: It’s got to be fun! Think about it: In your personal social media accounts, what is the stuff that you see your friends and family sharing the most? Is it updates from the finance team of some company? Or is it hilarious jokes, memes and one-liners? My money is on the latter. If you have a social media account, it’s likely that you see a lot of amusing things in your feed. A study by Ipsos about the motivations behind sharing on social media showed that people were second most likely to share “funny” things (43%) on social media, surpassed only by “interesting” things (61%). So what motivates us to share things that we consider to be fun? You may argue that your brand is serious and not some frivolous youth-oriented one to make a song and dance about. But hey, surely your brand isn’t more serious than Amyotrophic Lateral Sclerosis, or ALS? 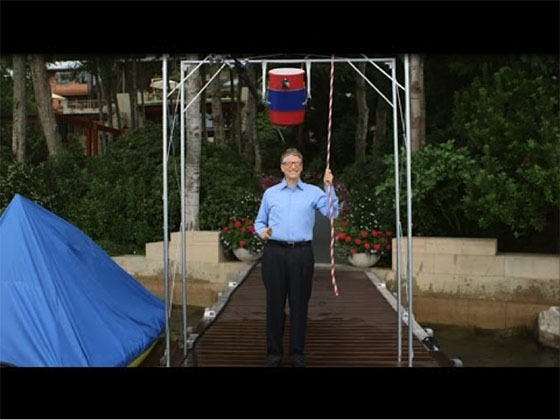 Watch Bill Gates take the ALS Ice Bucket Challenge here. Whoever said social media doesn’t result in conversions ought to take notes from the ALS Ice Bucket Challenge. Since the launch of the challenge on July 29, 2014, the ALS Association has received over $100 million in donations. An impressive number, especially when compared to the $2.5 million raised during the same period last year. So loosen up a little and give humor a chance. Do something silly that draws laughs. Even better, challenge your fans to do something fun. Have you shared something fun on social media recently? Humor leads to reciprocal relationships. People tend to look back at old memories through rose-tinted glasses. Brand interactions that evoke nostalgia also evoke happy, fuzzy memories that researchers believe transfer to the brand in question. Remember that communal relationship that we discussed with our customers? Nostalgia is an effective gateway to a personal, familial and communal relationship with your fans. Nostalgia is a strong psychological trigger that prompts sharing, engagement and social connectedness. When consumers experience nostalgia in a consumption context, they have a higher purchase likelihood with regard to the advertised products. When Pepsi ran their “Pepsi Throwback” campaign, targeting baby boomers with their retro 70s style packaging, raving fans eagerly swept cases off supermarket shelves. Pepsi Throwback ended up with a neat $41 million dollars in sales in under one year. How’s that for the power of nostalgia? From high-school pictures on Facebook to Buzzfeed lists about how life was awesome in the 80s and 90s, people are complete suckers for nostalgia. Every week, they share a photo of a vintage car – an ongoing series that serves to connect with longtime customers and trigger warm fuzzies. Post photos of your first office and employees, or show how your product has evolved over time. Create quizzes that induce nostalgia and encourage sharing. 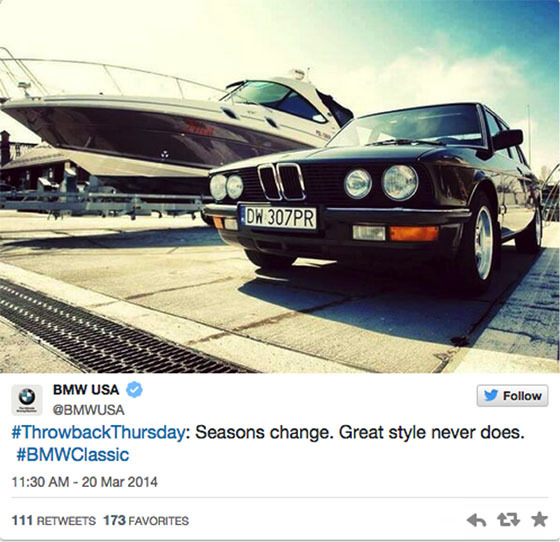 Nostalgia prompts followers to share, engage and develop a deeper relationship with your brand. Nobody likes to talk to people who can’t stop talking about themselves. The same goes for brands on social media. Your goal may be to sell more of your products, but harping on that one topic alone is sure to make you the most unpopular kid in class. People hate being sold to. That’s old news. What they do enjoy is sharing ideas, experiences, information – the very basis of social media. And though it’s a longer-term play, aligning yourself with the preferences of your followers can eventually lead to sales. Sharing information helps me do my job. I remember products and information sources better when I share them – and I’m more likely to use them. While information about your products and services may seem super interesting to you, your followers want to read about things that are relevant to their interests. Recognizing and responding to this establishes common ground between your brand and your fans – and is a great way to spark engagement, interest and eventually, conversions. Are you a healthcare brand? Share inspirational stories of patients that overcame tough illnesses. Are you a fashion retailer? Share the season’s latest style tips with your fashionista followers. A great example of this comes from fabrics and crafts store Jo-Ann. 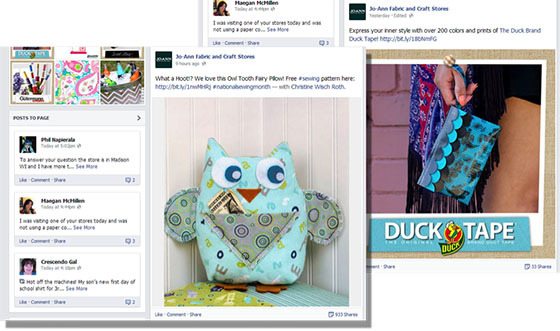 Craft store Jo-Ann’s DIY posts get exponentially more shares than their more “salesly” posts. Image Source. In the image above, you’ll see that their post on how to make an owl shaped pillow got over 900 shares. Contrast that against their more “salesy” post about the store now stocking “Duck Tape” fabrics that got a measly 33 shares. The verdict is loud and clear: the post with useful content that aligned itself with the interests of followers got an exponentially better reaction from fans and was a lot more engaging. And who knows? When their fans set out to create the “Owl Tooth Fairy Pillow” from the tutorial, they just might turn to Jo-Anns for their materials. If you look at your prospects as statistics – numbers on your analytics dashboard or sales figures on your balance sheet – then you’re not likely to be motivated to connect with them on a human level. Drop your bean counter glasses and look at users through the lens of what really makes them tick. Remember that, at the end of the day, your followers are human – and people put their faith (and their money) behind people they believe in and relate to.